Wearing the BSA's official "Field Uniform", also commonly known as a "Class A" uniform, is a way for Cub Scouts to show their pack pride and display awards and ranks they earn. Scouts are encouraged to wear their Class A uniforms to school on Pack Meeting days too. Pack 151 has specific uniform requirements based upon our program. Parents/guardians must purchase the required uniform and attach the emblems, badges and patches. An age-appropriate rank handbook is also required. Unless your den or pack leader says otherwise, you should always wear your "Class A" Cub Scout uniform to all Scouting activities—not only den and pack meetings, but every activity in which you take part with other Cub Scouts. The shirt should always be tucked in and orderly. Everyone should understand the importance of representing the entire Boy Scout of America organization while in uniform. The required Cub Scout shirt plus the required accessories and patches that make a "Class A" uniform costs roughly $60. We may have a limited number of free uniforms (youth and adult) available from our Uniform Exchange for those who are not in the financial position to pay for a new uniform. The Northern Star Scouting, Boy Scouts of America's Uniform Exchange program is where Scouts and Scout Leaders can get experienced (used) Scout uniforms for a nominal cost. It's also a great way to pass on your gently used uniforms (donations) to Scouts that are in need of a Scout uniform. All Scout shirts, pants, shorts, neckerchief, socks, patches, and more are welcome. Contact our Cubmaster or Committee Chair about the Uniform Exchange. An official blue Cub Scout Short Sleeve Shirt This shirt will last through third Grade - so size it appropriately. An official blue-colored Cub Scouts Web Belt (to attach adventure loops he'll eventually earn). Any award, badge, patch, award or adventure loop that your boy earns will be awarded (at no cost) during the monthly pack meetings. You will need to attach them to the uniform, but they are provided. The "activity uniform", also known as a "Class B uniform" is a special t-shirt that Pack 151 orders with a custom design. Class B t-shirts do not replace a regular Class A uniform (there's no place to display a Scout's hard-earned rank patches) but they do come in handy for certain occasions like summer camp. When specifically instructed to do so by den and pack leaders, Scouts may wear their Class B's for camp outs or during meetings when leaders have a messy activity prepared. They're great for times when we want the boys to look like Scouts, but are afraid that they'll loose or damage their uniforms with rough play and adventure. Contact your den leader or pack leader to order your Class B's. Scouts new to Pack 151 must purchase their own rank handbooks. The pack will provide subsequent rank handbooks in the following years. Advancement should be recorded in the handbook and reported to the den leaders and pack leaders via Scoutbook. There is no extra charge for Scoutbook. Uniform shirts, patches, belts and other Scouting items may be purchased in a store or online. Over the last few years, there have been many changes in the BSA's program handbooks and our uniforms. Ensure you're getting the right items with the help of official BSA Scout Shop experts. SEW or STICK ? It's up to you. Some parents like the ease of attaching patches with adhesives like Badge Magic. Problem is, that it doesn't always stick wash after wash, risking the loss of a patch. Some parents sew patches their Scout's patches, which may be more difficult, but it will likely last a long time. Some parents have found that dropping off the uniform at a tailoring shop like Sew What in downtown White Bear Lake is another good alternative. 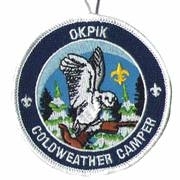 The insignia on a Cub Scouts uniform is important to communicate his membership in his den, pack and council and to reflect the awards and ranks that he has earned. The positioning of insignia on the right and left sleeves and the right pocket of the official uniform shirt are the same regardless of the boys rank, or whether he wears the Cub Scout blue shirt or the Boy Scout olive green shirt as a Webelos or Arrow of Light Scout. Those positions are shown below. The left pocket of a Cub Scout uniform is designed to demonstrate his current rank and other personal awards. For Bears, the left pocket will include a Bear patch when it's earned along with previously earned rank patches (such as Bobcat, Tiger, and Wolf). The illustrations below demonstrate proper insignia placement on the blue Scout uniform shirt. Purpose: A temporary patch is a good way to show what your Scout recently participated in or something that he's especially proud of. Earning it: Patches earned at the Pinewood Derby, Fall Festival, Monster Jam, Polar Cubs, Rodeo, Cub Scout camp, etc. are examples of temporary patches. Wearing it: These "fun" patches are worn by Cub Scouts, ONE at a time centered on the RIGHT pocket of the official Cub Scout or Boy Scout Class A field uniform; or suspended from the right pocket button of the field uniform. Some temporary patches have special loops which makes switching patches easy. Collecting them: Cub Scouts love to collect temporary patches. The collection grows as they participate more and more. They can be collected in a box, on a bulletin board, a red vest, red blanket, bag or in a million other ways.